Guilt and regret are powerful forms of clutter. They can be small, but continuously present at the back of your mind, weighing on you for years. Or, they can overwhelm all of your thoughts and be the ultimate distraction. Obviously, if we could find a way to avoid guilt and regret completely, we would. This is an impossible feat, though, as we’re human. We aren’t perfect. We do things that disappoint others and ourselves, and we simply strive to keep these disappointments to a minimum. How we handle the guilt and regret in our lives can play a large part in how much they clutter up our thoughts. Large regrets may never disappear completely. Even after apologies have been given and wrongs rectified the best they can, you still might carry some guilt with you the rest of your life. Conversely, and thankfully, most small regrets can be alleviated by taking actions to rectify the situation. Stop being defensive. When we have done something wrong, it can be easy to turn to the defense. Being defensive, however, isn’t helpful when we’ve actually done something wrong. Fight this reaction, and try your best not to make the regret worse. Acknowledge your mistake. As quickly after you recognize you’ve done something to disappoint others or yourself, acknowledge this mistake. If appropriate, apologize. Not all guilt-inducing situations call for an apology, but many do. If your situation would be improved with a heartfelt apology, step up and give one. Even if the apology should have come years ago, an apology is almost always welcome. Don’t apologize, though, if you’re not sincere. An insincere apology will only exacerbate a problem. If appropriate, provide restitution. Similar to an apology, not all guilt-inducing situations require restitution. However, if your situation would be improved through an act of righting the wrong, do it. If you borrowed a friend’s car and got in a fender bender, paying for the repairs and a rental car while her car is in the shop are good places to start to provide restitution. Do what you need to do. Not all guilt and regret comes from wronging someone else. If you are carrying guilt because you have failed to act in some way or procrastinated on something that is important to you, now is the time to act. Schedule time to do the thing you need to do. Stop making excuses and take care of what needs to get done. Stop guilt and regret from cluttering up your mental space: say the thing you need to say, and do the thing you need to do. Could you please do an article on how to keep mail organized? I considered myself pretty much clear of clutter, except for my mail. It’s driving me crazy. Three of these to-do items on my list today are great tasks to complete on a day you’ve decided to stay at home. From my home to yours, I bring you three uncluttered activities you can do on a lazy Saturday. Ask Unclutterer: How many hours will a family of four spend on laundry each week? Reader Amanda recently e-mailed and asked a few questions about laundry maintenance for a family of four. Slipper Genies allow you to clean your floors while you move about your home with no extra effort or supplies. I know this is a bit random but … I wondered if you had any recommendations of films with a minimalist/uncluttered theme? I’m looking for some inspiration! This is an interesting question since there are films that have a minimalist aesthetic (THX 1138) and films that promote the idea of uncluttered living (Wall-E). I’ve included examples of both for you. Also, I’m not the world’s biggest movie-goer, and I see more science fiction and Pixar films than anything else, so my suggestions are limited. Be sure to check the comments for even more ideas from our readers. Unless otherwise noted, these movies are NOT suitable for young children. Also, you might be interested in checking out Dogme 95 films that are extremely uncluttered in their production. Thank you, Ellis, for submitting your question for our Ask Unclutterer column. Again, be sure to check the comments for suggestions from our readers. I’m looking forward to learning about the additional film suggestions, too. Okay, okay, I’ll admit — I chose this office strictly because of the monitor background images. I think they’re amazing! What surprises me most is how they disguise the monitors. If you have a workspace in your bedroom or another area of your home where a computer might not always be welcome, creating a wallpaper like this can help to hide it. It’s as if you’re looking through the computer. Thanks, Louish, for submitting your creative workspace to our Flickr pool. Are you sabotaging your uncluttering and organizing efforts? In 1994, when the Beastie Boys released the album Ill Communication, I’m certain I listened to the song “Sabotage” continuously for weeks. The title of the song is fun to say (sab-o-tage), and the guitar and bass lines are rhythmically addictive. Additionally, sabotage is a powerful word that most everyone can relate to — we sabotage ourselves when we don’t trust in our abilities, we know people who sabotage relationships, and conniving companies sabotage their competitors to get a greater market share. It’s simple to sabotage yourself when uncluttering and organizing. The easiest way to do it is to make excuses for why you can’t do it: not enough time to do it perfectly, don’t know where to start, will take too long, no one in the family will respect the work put into it so why even bother. These excuses protect you from potential failure and change. I remember sabotaging myself like this numerous times when I was embarking on my initial uncluttering project. Another way to sabotage yourself is to take on too much at a time. You pack your schedule to the brim with outside responsibilities, and then decide you need to unclutter your entire house in two hours. When you fail to become super human and don’t succeed at your uncluttering efforts, you throw in the towel and give up. The sabotage is complete. There are hundreds of ways to sabotage your uncluttering and organizing efforts, and just one solution for all of them — admit to yourself what you’re doing and that you’re sabotaging your success. The minute you admit you’re acting in a way counter-productive to your success, you can stop that behavior. Instead of an excuse, you can spend your time and energy searching for a solution. Instead of having unrealistic expectations, you can set more practical and obtainable goals. Anyone who is of sound mind and body can unclutter and organize his or her life. There is no need to be your biggest obstacle. Stop the sabotage. It is strange to me that this shoe-horn looking device is something I want to own. 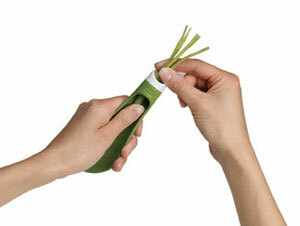 But, French-cut green beans are my favorite style for preparing long beans. And, it took me awhile to perfect cutting them by hand with a knife (beans are pesky and move around). I will refrain from buying this, though, since it’s not something I need and I’ve become someone actually quite fast at cutting beans with a knife. Thanks go to reader Hannah for finding this unitasker. The elgato EyeTV Hybrid lets you watch televised programming on your Mac without needing a dedicated television set. With my foot still in a cast, I’m obviously not running my typical 15 miles a week. Since I can’t take to the streets, I have been doing a lot of reading about running instead. I’ll admit, it’s a bit frustrating to read about something I can’t do, but I’ve learned a great deal and will use this knowledge when I start running again. During my readings about running, I came across an article in the February 2011 issue of Runner’s World magazine that has potential application for unclutterers. The article “The Magic of Mantras” explores using positive self-talk to help push you through the difficult parts of a race, and could easily work for helping you continue through the onerous parts of uncluttering. So what makes a good mantra? One that’s short, positive, instructive, and full of action words. Walker suggests preparing multiple mantras before a race tailored to various challenges. And don’t limit yourself to “real” words. A made-up word works for Tara Anderson, a 34-year-old runner in Boulder who recites, Lighter, softer, faster, relaxer. “I repeat it with each footstrike, and if I’m having a problem, I’ll repeat the relevant part until I’m in the flow,” she says. Her phrase helped her set a three-minute P[ersonal] R[ecord] in a 10-K in 2009. Five minutes or less? The answer is yes. Do you have a mantra? Could using some positive self-talk help you to achieve your uncluttering and organizing goals? Tell us what you tell yourself in our comments section of this post. Every Sunday night my freshman year of college, our resident advisor would hold floor meetings. She would review what was on the schedule for the coming week, we would plan activities, and, inevitably, someone would forget about a bag of microwave popcorn and the smell of burning kernels would accompany our discussions. When we moved out of the dorms, my housemates and I kept up the tradition, but without the scent of burning popcorn. We would talk about things that needed to get done around the house, how much everyone owed for shared bills, if we had people coming in from out-of-town, if we were leaving town, or if we had big tests on the schedule and needed the house to be quiet for studying and sleeping. By the time I got married, I had been having house meetings every Sunday night for almost a decade. Another decade later, and my husband and I continue to sit down for 15 or 20 minutes once a week and discuss the business of our house and our lives. We finalize grocery lists, talk about anticipated work loads, look at our weekly schedules, decide who is going to run errands, and whatever else needs discussing. These meetings keep us sane and keep our lives running smoothly. Keep things low key. These meetings should be helpful, not stressful. Make a list of what you want to cover, but be willing to let the topics flow naturally. It’s not a Congressional hearing, it’s just a time for everyone in the house to communicate. Make the meetings routine. 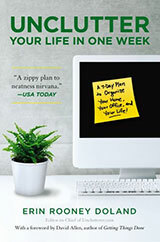 Set a date and time for your weekly meetings and stick to the schedule. People won’t forget about the meetings when they’re a regular part of life. Cover whatever you need to cover. People are different, and what you need to discuss each week will be based on who lives with you. The point is to help make life easier and for the house to run more smoothly, so discuss whatever subjects you need to make this happen. Does your house and/or family hold house meetings? Would a meeting help life be less stressful under your roof? If you have weekly meetings in your home, what topics are addressed during your discussions? The stuff being marketed to first-time pregnant women and parents is about 1/4 necessary, 1/4 might-be useful to some people, and 1/2 scams and clutter. As proof of the scams and clutter category, I present the Nuvo Ritmo Pregnancy Sound System. The Dogme 95 movement shows us how self-imposed limitations can help us focus on what’s really important in our work. Unfortunately, there isn’t a one-size-fits-all response for how to handle the possessions of someone who has passed away. That is why I almost always recommend contacting a professional organizer who specializes in exactly these types of cases. 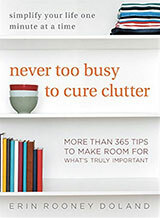 If you’re in the market for a comprehensive, concrete, methodical guide to home organization, Regina Leeds’ latest book is an excellent place to start. When it comes to clutter the federal government has all of us beat. The tax code alone is over 60,000 pages and continues to grow by leaps and bounds. Sometimes all-white workspaces we have can seem cold and sterile. 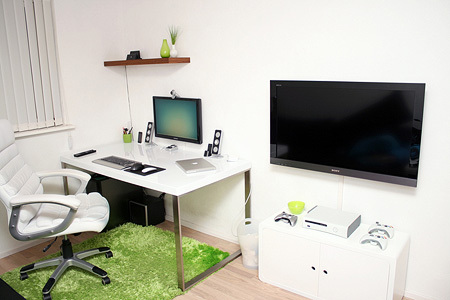 The consistent use of a strong accent color in this office adds some much needed warmth to the mix. Thank you, Arunan, for submitting your office to our workspace Flickr pool.